I currently have this cute little guy in my etsy shop. He is made out of corduroy, wool felt, and cute woodsy printed flannel. His limbs have been double stitched so that he's durable. And his face is hand-embroidered. I will make more as I have some left over corduroy. I also have some fabric to make a cute little girl fox. 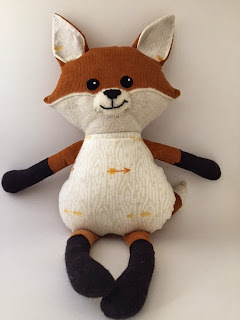 I had a lot of fun making this little fox. I don't know what it is about making little stuffed toys. It makes me happy to see them come to life.